PACIFIC OCEAN - The Arleigh Burke-class guided-missile destroyer USS Kidd (DDG 100) participated in the Oceania Maritime Security Initiative (OMSI) with the U.S. Coast Guard's 14th District, Jan. 7 to Feb. 2 in the Western Pacific Ocean. "OMSI is aimed to diminish transnational illegal activity and enhance regional security and interoperability," said Cmdr. Gabe Varela, Kidd's commanding officer. "By combining forces with the Coast Guard we were able combat illegal, unreported, and unregulated (IUU) fishing activity." The Navy-Coast Guard team, including the two embarked MH-60R helicopters from Helicopter Martime Strike Squadron (HSM) 78, conducted 46 external visual inspections and 13 boardings with internal inspections of fishing vessels across three separate jurisdictional areas - high seas, Marshall Islands and Nauru exclusive economic zones (EEZ). The boarding inspection resulted in several documented violations and, more importantly, demonstrated U.S .commitment to regulating these fishing areas in partnership with our friends in the region. "This mission really strengthened our coordination and relationship with the Coast Guard," said Lt. Doug Robb, Kidd's operations officer. "With their Law Enforcement Detachment embarked we were able to leverage our respective strengths to safely and efficiently conduct these important boardings." "OMSI is just part of a whole array of activities we are supporting in the Indo-Asia-Pacific region to help allies and partners with their critical concern areas while upholding established internal norms for conduct in the maritime realm" said Cmdr. T.J. Zerr, Kidd's executive officer. OMSI is a Secretary of Defense program which leverages Department of Defense assets transiting the region to increase the U.S. Coast Guard's maritime domain awareness (MDA), ultimately supporting its maritime law enforcement operations in Oceania. 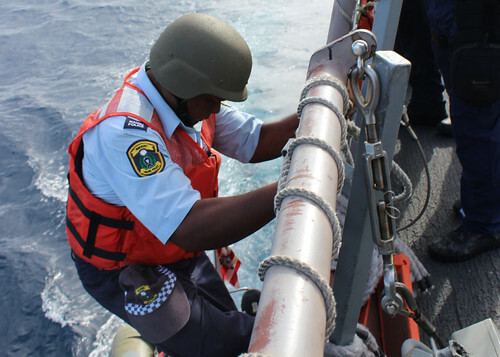 The U.S. Coast Guard is responsible for patrolling the waters around the numerous islands associated with the United States throughout the region. Each of these islands have territorial waters stretching out to 12 miles from shore. Beyond that, stretching out to 200 nautical miles is an exclusive economic zone (EEZ), an area defined by international law that allows each nation exclusive rights to the exploration and use of marine resources. Oceania contains 43 percent, or approximately 1.3 million square miles, of United States' EEZs. Kidd is deployed to the 7th Fleet area of operations supporting security and stability in the Indo-Asia-Pacific.